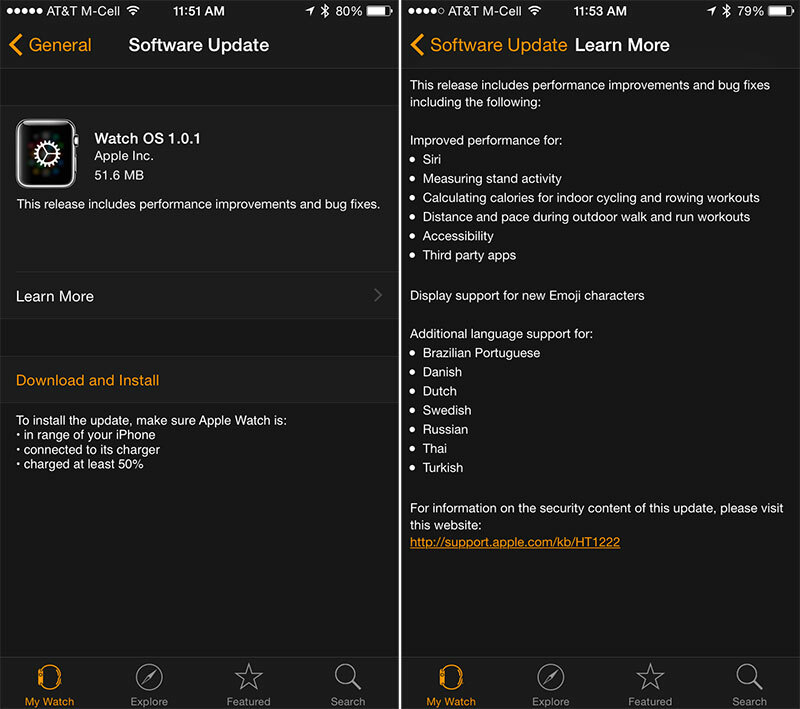 The new software can be downloaded through the dedicated Apple Watch app on the iPhone by going to General --> Software Update. To install the update, the Apple Watch must be placed on the charger and it must be in range of the iPhone. Watch OS 1.0.1 includes performance improvements and bug fixes for Siri, measuring stand activity, calculating calories for indoor cycling and rowing workouts, distance and pace during outdoor walking and running workouts, accessibility, and third-party apps. The software update also includes support for new the emojis found in iOS 8.3 and it provides additional language support for Brazilian Portuguese, Danish, Dutch, Swedish, Russian, Thai, and Turkish. Apple has been steadily shipping Apple Watch devices out to customers, but supplies remain constrained and some Apple Watch orders have not yet shipped out. Customers receiving an Apple Watch shortly after today's update will need to update the software on the device after taking it out of the box. Hopefully Apple's servers will be able to handle the onslaught from the dozens of simultaneous downloads. Rumor has it all five people who have received their watches already are thrilled. My wife asked me to return her Apple Watch today. She can't get accurate fitness results. It's way off from her Polar. She even bought a bluetooth polar chest strap. Maybe this update will help? Mmm... after update, feels watchier. i just hope there is battery life improvements when using the workout apps. Really? I wear my Apple Watch all day (ca. 16h) including a 2 hour workout and when I go to sleep my Apple Watch is at 15% battery. Yet the watch is still an irrelevant device, displaying no actual use... I don't think any review out there blatantly states that anyone should run out to buy one. Yup, a nice watch that also does a lot more is completely useless. Troll award for you. "Innovative TouchWiz UI"? LOL. What? How are any of us iPad naysayers wrong? Our criticisms of this crap device still stand today as they did when it was first unveiled. It's a big iPod touch not capable of satisfying any computing needs on or near the level of a laptop or a truly modern tablet. Apple has yet to address any of the shortcomings of this product, including the ridiculous product name. The iPad's value as a novelty is beginning to waver as indicated in the quarterly sales decline as people are beginning to see the disturbing truth behind this product's existence: to separate you from your hard-earned cash by repackaging low-tech parts from a 4.7 body into a 9.7 body. Apple has figured out how to sell the same exact product twice to the gullible. Every time I'm at an modest coffee shop and see someone pull out an iPad I respond by pulling out my Galaxy Tab 4 10.1 rocking Android 5.0.2 Lollipop with Samsung's innovative TouchWiz UI, a lightning fast quard core Qualcomm Snapdragon, 1.5 GB RAM, and of course a microSDXC card slot for expansion. Bam. Checkmate. At work, and can't update without it being on the charger... lame! You realize iPad-dude neither knows nor cares about any of your random number specs, simply sees a generic Galaxy-something-or-other, and feels sorry for you that you're obviously too poor to afford a real iPad? You might spend your time trying to out-iPad the iPad-dudes, but nobody ever tried to out-Android anyone. You're losing a race that nobody else is participating in.